SEOUL, Sept. 13 (Yonhap) — K-pop boy band BTS will release three Japanese songs in November, including one to be written by high-profile Japanese producer Yasushi Akimoto, according to a Japanese news report. “BTS will release new Japanese single ‘Bird’ on Nov. 7, along with Japanese versions of two of their existing songs, ‘Fake Love,’ and ‘Airplane pt.2,’” Japan’s Nikkan Sports reported on Wednesday. “‘Bird’ will be written by Akimoto,” the report also said, referring to the record producer famous for his creation of Japan’s top idol group, AKB48. 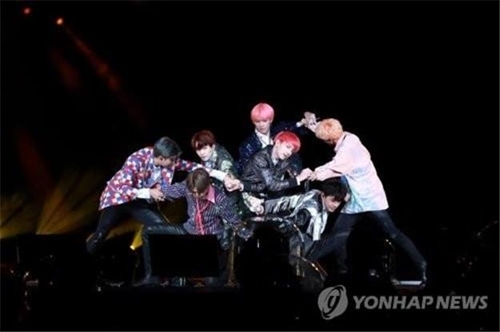 The report noted that Bang Si-hyuk, the head of BTS’ management agency, Bit Hit Entertainment, arranged the boy group’s collaboration with the Japanese producer because Bang supports his musical philosophy. Bang reached out to the Japanese producer, asking for his lyrics for the new song, it also said. The Japanese release will come shortly ahead of the boy band’s Japanese leg of their ongoing world tour. The band will perform on Nov. 13 and 14 at Tokyo Dome before playing in Osaka later in November, Nagoya in January and Fukuoka in February.